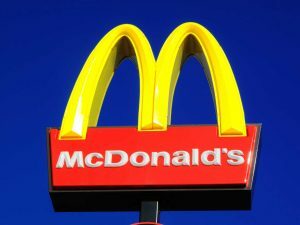 McDonald’s salads have been linked to an outbreak of foodborne illness that has sickened dozens in recent weeks. Public health officials in Illinois and Iowa are investigating more than 20 cases in Illinois and another 15 cases in Iowa. Those who have fell ill say they had consumed McDonald’s salads within days of suffering symptoms. Those affected have been diagnosed with Cyclosporiasis. The intestinal illness is caused by the Cyclospora parasite and symptoms include diarrhea, nausea, fatigue, and low-grade fever. In the past several years, several outbreaks of Cyclosporiasis connected to contaminated produce have occurred in the U.S.
Health officials in both states said McDonald’s is cooperating with the investigation. Illinois public health director Nirav Shah said, “Although a link has been made to salads sold in McDonald’s restaurants in some Illinois cases, public health officials continue to investigate other sources.” The Centers for Disease Control and Prevention and the Food and Drug Administration are also assisting with the investigation.